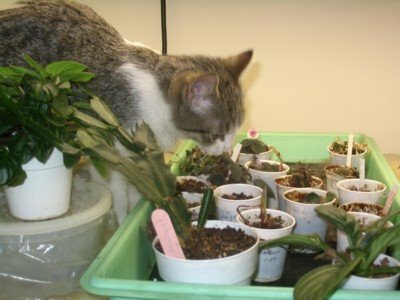 North Star African Violet Council Twin Cities: Cat-astrophic Plant Pathogen? Catchy title aside, let's look at this catagory of plant pests. Today's Problems and Solutions question: Is a capering cat a catalyst for plant room cataclysm? Or is this calm kitten only considering catching up on a much needed catnap? Does anyone have any interesting links to sites relating to violets and gesneriads that they would like to share? Send us an email with the link information and we'll post it for everyone to take a look at. Fortunately my cats don't seem too interested in my plants but I've used crumpled up aluminum foil by things I want my cats to avoid. They aren't too fond of stepping on it. Has anyone tried growing some aromatic herbs like rosemary or basil by your other plants on the light stand? Animals aren't always interested in things with a scent. Parakeets and cockatiels love just about any plant. If they're flying around, be sure your plants are behind closed doors. Our rabbit considered the AV's a smorgasborad. He sampled each one within reach. In his case, chicken wire around the plant stand to the height he could not jump. In gardening catalogs I have seen a type of plastic "grass" that cats won't walk on. Fortunately the only plant my cat liked was a Spider Plant! She never bothered my violets. I was lucky! The field trip to Bachman's growing range.